Three concerts planned for St. Louis this weekend were canceled as protests over the acquittal of a white former police officer in the 2011 killing of a black man continued Saturday, and police said they would continue to arrest those who break the law. Nine city police officers, a county police officer, and a state patrol officer were injured in protests that turned violent Friday night following a judge’s verdict finding former officer Jason Stockley not guilty of first-degree murder in the death of Anthony Lamar Smith following a car chase. Police said that 33 arrests were made Friday. Missouri Gov. Eric Greitens said Saturday that police are dedicated to protecting peaceful protesters, but "if you assault a law enforcement officer, we're going to arrest you." "Violence and vandalism is not protest, it is a crime," Greitens said. He said the National Guard is on standby. "If they are needed, they will step in," he said. The rock band U2 canceled a planned Saturday concert in St. Louis over security concerns. The band and Live Nation said in a statement that police had said law enforcement was not in a position to provide the usual protection for the audience under the circumstances. "In light of this information, we cannot in good conscience risk our fans’ safety by proceeding with tonight’s concert," Live Nation and U2 said in the statement posted on the band's website. The St. Louis Symphony said it was also canceling a planned "Harry Potter and the Chamber of Secrets — In Concert" event. And an Ed Sheeran concert planned at the Scottrade Center for Sunday was also canceled, organizers said. 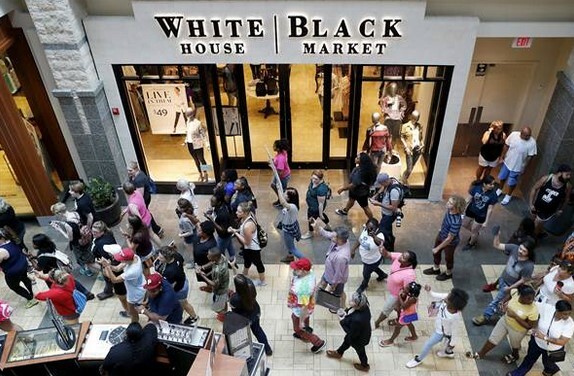 Demonstrators marched and held a demonstration in West County Center mall on Saturday, holding signs reading "Black Lives Matter" and "Murder Is Illegal." Marchers moved on to the nearby Chesterfield mall and the Taste of St. Louis, NBC affiliate KSDK reported. A large march took place in the nearby University City Saturday evening, which at times blocked an intersections and streets according to police and aerial video. After three hours of marching and chanting, protesters disbanded with plans to gather and demonstrate again Sunday afternoon in St. Louis. Stockley, the acquitted former officer, insisted he saw 24-year-old Anthony Lamar Smith holding a gun and felt he was in imminent danger when he opened fire. Prosecutors said the officer planted a gun in Smith's car after the shooting. St. Louis Circuit Judge Timothy Wilson said in his ruling that Stockley “ordered Smith to open the door and to show his hands” before firing, and that there was no evidence that Stockley planted the gun. The judge said the state's own witnesses "testified that the absence of a person's DNA on a gun does not mean that person did not touch the gun." In an interview with the St. Louis Post-Dispatch, Stockley said he understands how the video of him fatally shooting Smith looks bad to investigators and the public, but he said the optics have to be separated from the facts and he did nothing wrong. "I can feel for and I understand what the family is going through, and I know everyone wants someone to blame, but I'm just not the guy," he said. St. Louis police said Friday night that officers were pelted with rocks and bricks. The department said "agitators" descended on the home of the city’s mayor, Lyda Krewson, and threw rocks, breaking windows. Police used tear gas to disperse the crowd. Acting St. Louis Police Chief Lawrence O'Toole said Saturday that the "vast majority" of protesters Friday were peaceful. "However, after dark, the agitators outnumbered the peaceful demonstrators," he said. "The unruly crowd became a mob." He said fires were set, windows of cars and businesses were smashed, and two police cars were damaged. Ten buildings, including the public library, had windows smashed or damaged, police said. Krewson called the decisions to cancel the concerts "disappointing" but added "the issues being protested are real impediments to the success of our city." "I encourage everyone to go about their lives," she said. Homicide detectives from the St. Louis police department deemed the shooting of Smith justified. Stockley resigned from the department in 2013, the same year that the Board of Police Commissioners settled a wrongful death suit with Smith's family for $900,000. Stockley was not charged in the case until 2016, when prosecutors said new evidence was uncovered. 0 Response to "Second Day of Protests in St. Louis After Former Officer Acquitted"